Aloha bloggy friends! Welcome to this edition of Aloha Friday fun! I hope that you have all had a great week, and managed to stay cool. It topped 105 degrees here yesterday, yikes! On to my question of the week...I recently discovered Hendrickson's Original Sweet Vinegar and Olive Oil Dressing & Marinade and I'm totally hooked. This stuff is soooo good and virtually fat free! It's the perfect topping for a fresh summer salad, and a great marinade for cucumbers & tomatoes, pasta salad or even grilled chicken. I just love it. It's my new favorite thing. Have you ever tried it? It's been around for years, but I just happened upon it at the grocery store a couple of weeks ago. Where has this stuff been all my life? Think of all the calories I could have been saving on Reduced Fat Ranch, lol! My question to you is: What's your new favorite thing? Thanks for stopping by for a visit today! Your comments make my day :) Before you leave, be sure to enter my awesome giveaway for a $50 gift code to NOVICA.com! 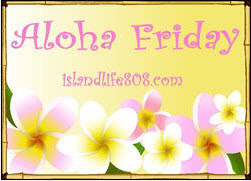 And, don't forget to visit An Island Life for more Aloha Friday fun. My new favorite thing is running. My new favorite things is Bible story themed Vacation Bible Schools (where the kids get to "experience" the story). We just ended an Egypt themed VBS where the kids got to visit Joseph every day and watch him go from Prizon to Palace. My kids really responded too it and I had soo much fun with it too! My new favorite thing is the twilight series. I am on to my next book...I know, I got sucked in! I'll say fruit. I'm really into fruit for some reason lately. Right now, my new favorite thing is my Hapari swimsuit.